Back in 1975 the Broadway version of The Wiz won seven Tony Awards and was one of the first mainstream musicals to feature an all African-American cast. The super soul musical adaptation of L. Frank Baum's magical land of witches, wizards, munchkins, flying monkeys, a Yellow Brick Road and an Emerald City was also made into a big screen movie famously boasting Diana Ross as 'Dorothy' and Michael Jackson as the 'Scarecrow'. This year NBC hopes it can click its magic slippers together and recreate the success of its predecessors with its third live holiday musical featuring an all-star cast. 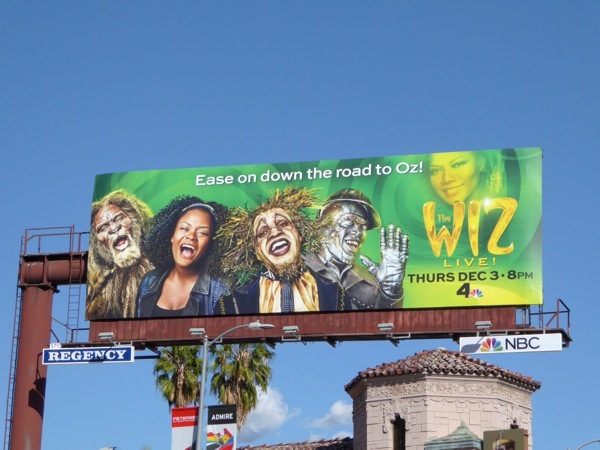 Rather than relying on just two names like with Peter Pan last year, this year Queen Latifah headlines as 'The Wiz', Ne-Yo stars as the 'Tin-Man', Elijah Kelley plays the 'Scarecrow', David Alan Grier is 'The Cowardly Lion', Mary J. Blige is the 'Wicked Witch of the West', Uzo Aduba stars as 'Glinda the Good Witch', Amber Riley is 'Addapearle the Good Witch of the North', Common is the Emerald City's gatekeeper and this live telecast introduces newcomer Shanice Williams as 'Dorothy Gale'. 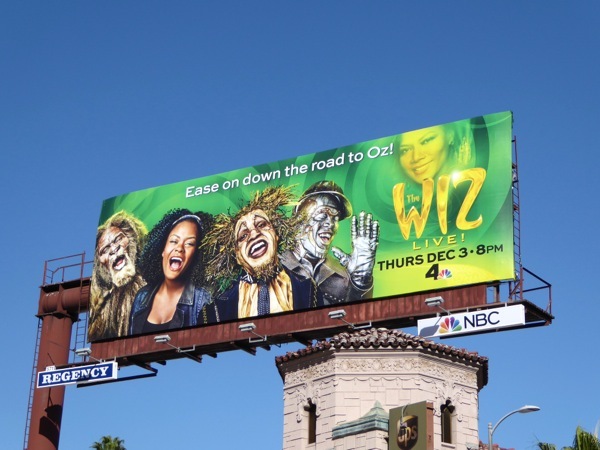 This joyful billboard for The Wiz Live! was snapped along Sunset Boulevard at Laurel Canyon Boulevard on November 10, 2015. If you're a fan of musicals, be sure to also check out The Sound of Music Live! 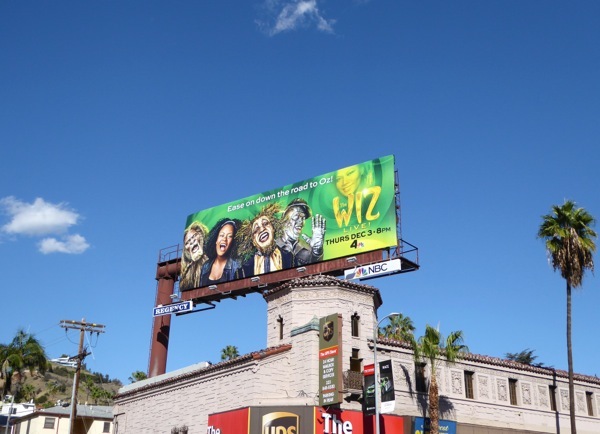 billboard from 2013 and the Peter Pan Live! billboard from 2014. 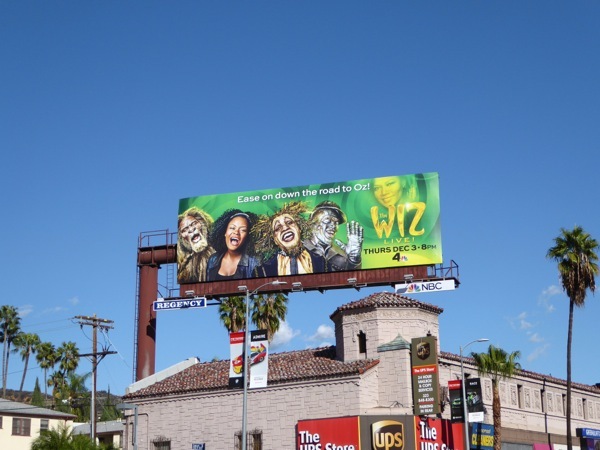 Plus if you're a fan of the wonderful land of Oz, be sure to also check out these billboards for Disney's Oz The Great and Powerful movie. 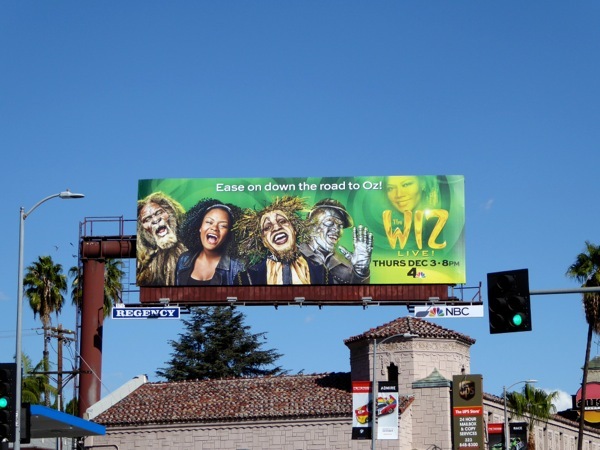 Now go ahead and get in the holiday spirit and 'ease on down the road to Oz'. 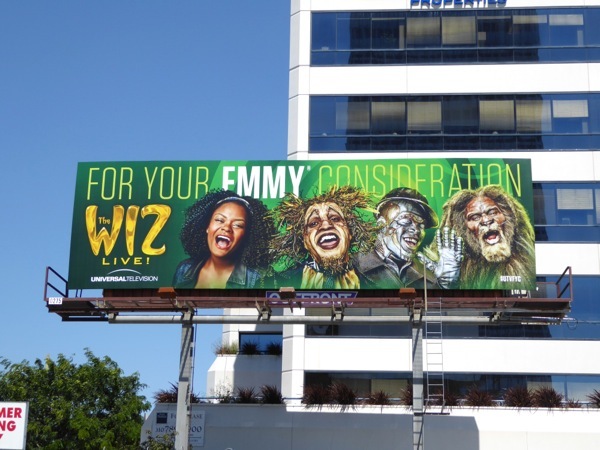 UPDATED: If you loved The Wiz Live!, then you'll love these Emmy consideration billboards for the TV musical spectacular. 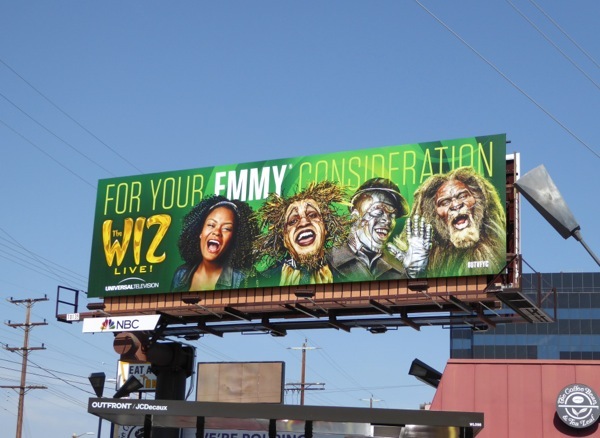 Let's see if these Universal Television outdoor ads can help garner some TV Academy nominations from somewhere over the rainbow. 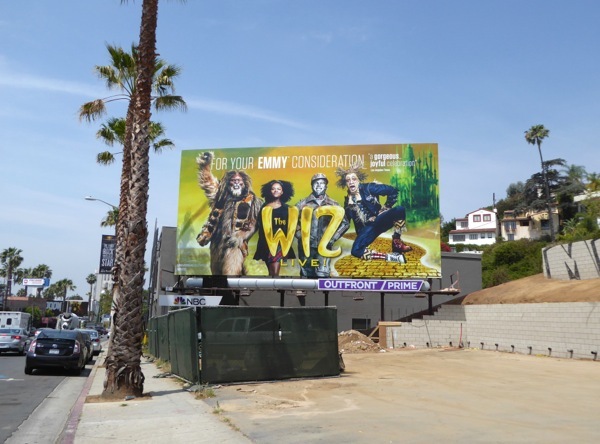 And here's another of the landscape Emmy billboards spotted along Wilshire Boulevard on June 16, 2016. 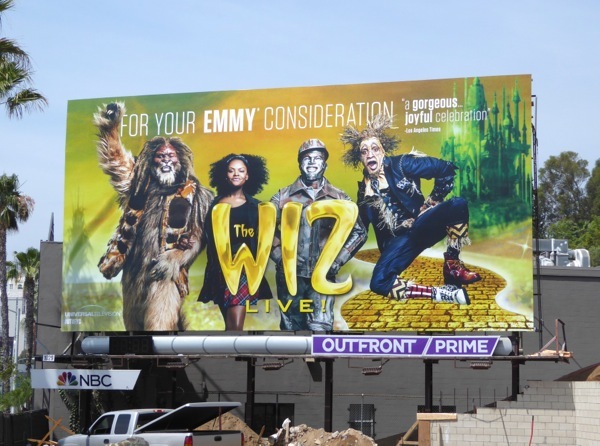 UPDATED: Congratulations to The Wiz Live! for achieving six Emmy nominations. 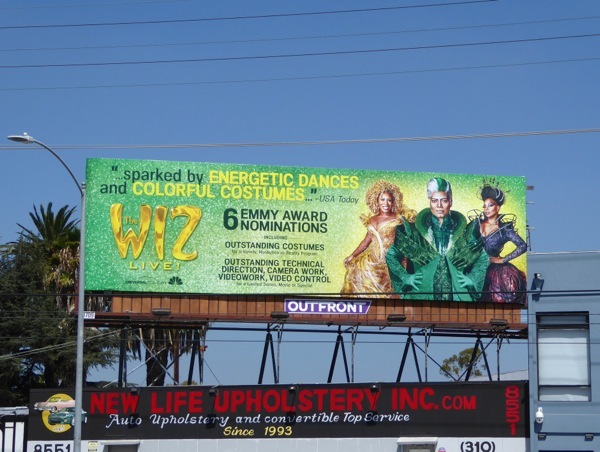 Here's a vibrant billboard, showcasing some of the musical's elaborate costume designs and technical categories to help garner TV Academy votes, snapped along Venice Boulevard on August 9, 2016. 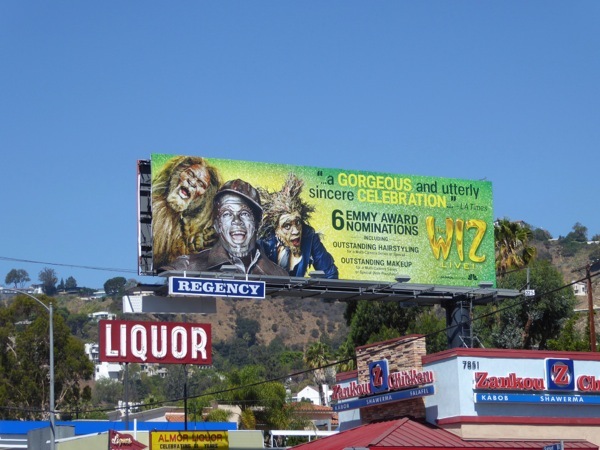 Plus here's another Emmy nomination billboard highlighting the categories for Outstanding Hair and Makeup spied along Sunset Boulevard on August 15, 2016.